"I wasn't put off by her eyes and health problems. We think she is adorable. She is warm and cuddly and settling in well." Nineteen years old and nearly blind in both eyes, the tortoiseshell was discovered dazed and stumbling alongside a road back in May by a Good Samaritan who promptly contacted the charity's Midsomer Norton and Radstock branch which came and collected her. To date, no one connected with the group has been willing to publicly hazard so much as a guess as to how long she had been sleeping rough. In a staggering indictment of the abject callousness of the supposedly cat-loving English public, Pops was forced to languish behind bars for the next three months because not so much as a solitary soul could be found throughout the realm who was willing to provide her with a second chance at life. The Stolperstein is believed to have been her advanced years and health-related liabilities. "I think because of her sight and health problems she isn't everyone's first choice," Belinda Dark of the Midsomer Norton and Radstock branch told the Western Daily Press of Bristol on July 14th. 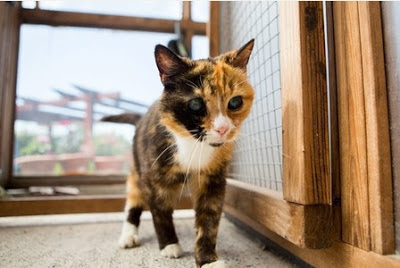 (See "United Kingdom's Oldest Rescue Cat Pops, Nineteen, Can't Find Home Due to Terrifying Eyes.") "Her appearance isn't as favorable as some of the younger kittens. I think people are put off (by her) eyes and how frail she is." Such a revoltingly unsympathetic attitude also demonstrated the general public's total lack of both intelligence and taste because there is absolutely nothing terrifying about her appearance; on the contrary, she is a classy, lovely, and elegant female. Plus, she actually is in pretty good physical condition for a cat of her age with the notable exception of her diminished ocular acuity. "Her sight is very poor and she is a weak old cat but she loves being close to you and being petted," Dark added to the Western Daily Press. "She's friendly and doing well for her age." Belatedly realizing that a bolder initiative was needed, the charity launched an appeal in mid-July through the capitalist media, its own web site, and Facebook in order to secure a new and permanent home for her. Even that effort took a while to bear fruit but in the end both Pops and the charity were left with a proverbial embarrassment of riches. "Our homing officer Mollie has been inundated with phone calls about Pops," Dark disclosed to London's Mirror on August 19th. 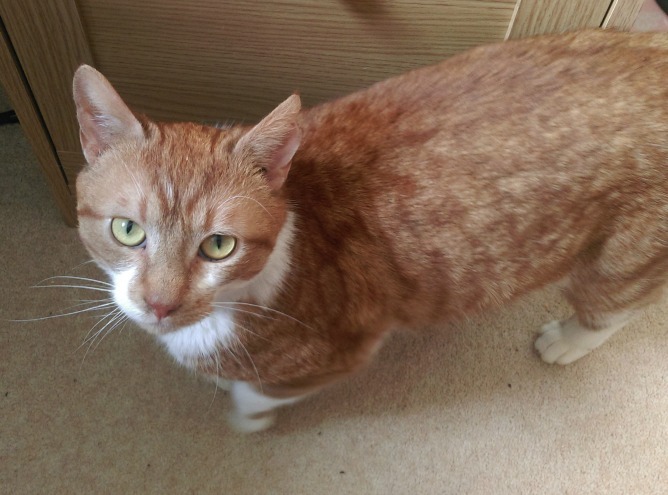 (See "Rescue Cat Finally Gets Rehomed after Story of Her 'Terrifying' Eyes Goes Global.") "We had nearly two-hundred offers to our web site to home Pops not to mention the offers via Facebook." Although it received inquiries from as far away as Deutschland, France, Egypt, and the United States, the organization ultimately decided against allowing this walking and talking national treasure to depart English soil. "As exciting as it would be for Pops to be a globetrotter it was important we rehomed her in her native Bath," Dark added to the Mirror. "She is an elderly cat and, therefore, it was important she didn't have to travel long distance." allowed her to go even if doing so would have meant saving her life. If Cats Protection was caught off guard by the magnitude of the response that it received from the public, Pops' new guardian was every bit as pleasantly surprised at coming out on top in the sweepstakes to claim her. "I couldn't believe no one had snapped her up already," that very fortunate individual exclaimed to the Mirror. "It is funny to think of so many people wanting to take her in, especially from so far and wide." Apparently Pops' new owner had been totally in the dark about her desperate plight until reading about her in either the newspaper or online. "I really felt sorry for her when I read her story. At nineteen years old she should be able to live out her final years in the comfort of her own home," the adopter added to the Mirror. "We are happy we were the lucky ones who got to take her in." It additionally is heartening that there are still some caring individuals left in this world who are capable of looking beyond a cat's age and health problems in order to see her intrinsic worth. "I wasn't put off by her eyes and health problems. We think she is adorable" Pops' new protector told the Mirror. "She is warm and cuddly and settling in well." Whereas that is the best outcome that ever could have been imagined for Pops, even it is nonetheless tinged with sadness. That is because the world, in all likelihood, has seen and heard the last of her. No one outside of either her new family or Cats Protection ever will know how well she adjusted to her new home. No periodic updates on her health will be posted online and it is highly unlikely that when it finally comes her time to go that even her obituary will be printed in the newspapers. In effect, she already has ceased to exist as far as the various mediums are concerned. That is all the more deplorable in that Pops is a long way from being out of the woods. The most pressing concern is her personal safety and due to her poor eyesight and other frailties it is imperative that she not be permitted to roam without the accompaniment of a chaperon. She can still be allowed out into the garden, however, so long as it is fenced-in and someone is watching over her. The sunlight, fresh air, and exercise will do her good. Her indoor environment can be made considerably friendlier by wrapping chairs, table legs, and other blunt objects in protective padding so as to ensure that she does not injure herself whenever she accidentally bumps into them. Also, the rooms in her new house can be outfitted with different types of surfaces, such as tiles, carpeting, and wood flooring, so as to assist her in reorienting herself should she for whatever reason lose her bearings. A proper diet, an indoor environment that is free of harmful toxins, and periodic veterinary visits are essential for a cat of Pops' age. On the positive side, she is anything but obese and still quite capable of not only getting around on her own but of feeding herself and using a litter box. Since no specifics of her condition have been publicly divulged, it is mere speculation as to the source of Pops' vision problems. Whereas tumors, glaucoma, cataracts, entropion, conjunctivitis, detached retinas, and trauma can lead to the onset of blindness, hypertension comes in for a lion's share of the blame. Cataracts can be surgically removed but doing so is expensive. For example, a five-month-old kitten named Honeybee that turned up at the Willows Cat Shelter in East Boldon, Tyne and Wear, was diagnosed with one on each eye in November of 2008. An operation could have saved her eyesight but the shelter, unfortunately, did not have the £1,400 demanded by veterinary surgeons in order to remove them. 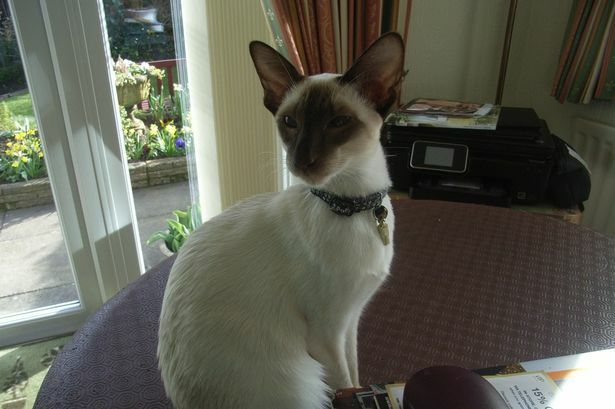 "I understand that this is a huge amount of money to spend on one cat, and I keep thinking about the amount of cats I could care for with that kind of money," the shelter's Maria Harrison candidly acknowledged to The Shields Gazette of South Shields on November 15, 2008. (See "Cat Needs Op to Save Sight.") "But Honeybee isn't an old cat, she's just a few months old with her whole life ahead of her. It would be heartbreaking to see her go blind." A Honeybee Treatment Fund was established and the St. Francis Animal Rescue of South Shields generously volunteered its services in support of Williams' fundraising effort but it is not known if their combined approach was sufficient in order to have saved Honeybee's eyesight. Cats that are born missing large sections of their eyelids also can go blind because the genetic defect will not allow them to either blink or to produce any natural lubrication for their eyes. That was the sad fate that a two-year-old tom named Noble from Taylor, forty-six kilometers northeast of Austin, was diagnosed with in June of 2009. "Noble was probably born without big sections of his eyelids," Roy Smith of the Central Texas Cat Hospital in Round Rock told the Austin American-Statesman on July 27, 2009. (See "Donors Act Fast to Help Cat with No Eyelids.") "It's very rare, and I've only seen ten cases in my forty-eight years as a veterinarian." Noble's distraught guardian, Dawn Shepherd, was not about to allow him to go blind, however, without first putting up a fight. Toward that end, she made some inquiries whereby she eventually learned that small pieces of his remnant eyelids in the corners of his eyes could be surgically stretched so that they covered most of his eyes. 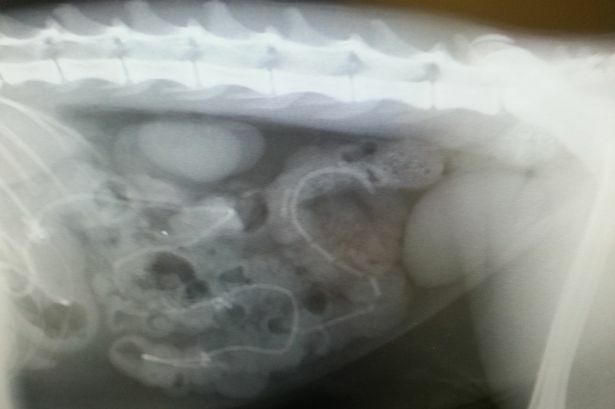 The procedure was not going to be cheap but Shepherd, amazingly, was able to raise the $2,000 demanded by a veterinary surgeon in San Antonio within two days. Unfortunately, it has not been possible to determine either if the surgery was successful or even if Noble is still alive today. 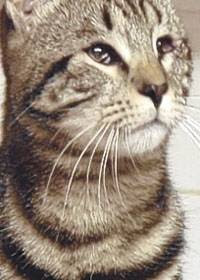 In addition to being born without fully functional eyelids, some cats suffer from entropion whereby their eyelids are folded inward and thus cause their eyelashes to scratch their corneas. Honeybee earlier had been successfully treated for this condition but a fifteen-year-old tuxedo named Ernest, who had spent his last thirteen years as the office cat at the RSPCA's Godshill shelter on the Isle of Wight, was deemed to be too old to be anesthetized. Instead, the RSPCA elected to fit him with contact lenses which were scheduled to have been removed and cleaned every three weeks by staffers at the shelter. "He's much more comfortable," Les Burrows of Godshill told Sky News of the Isleworth section of London on December 16, 2008. (See "Ernest the Cat Has His Sight Restored by Contact Lenses in What Is Believed to Be a Medical First.") "Previously his eyes were shut, now they are open." 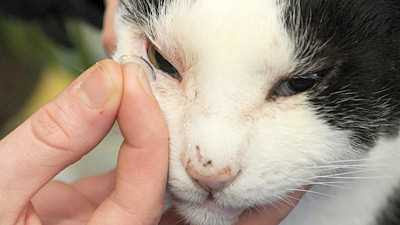 Depending upon the specifics of her condition and how well Ernest and other felines have fared, contact lenses might be a possible alternative for Pops. Aside from them it is unclear what other options would be available to her in that placing her under general anesthesia as a prelude to operating on her eyes likely is out of the question due to her age. 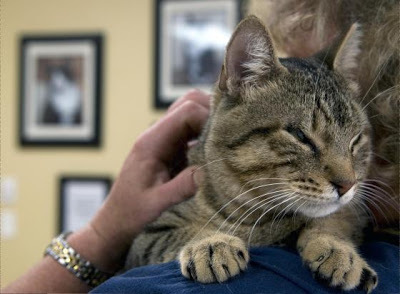 Generally speaking, very little is being done for cats like Pops who are losing their eyesight. While that is reprehensible enough in its own right, it pales in comparison to the diabolical abuse that is being meted out to tens of thousands of them all around the world by an army of vivisectors who claim to be searching for cures to various forms of blindness in humans. For example, Kristina Narfstrom has devoted her miserable, worthless existence to falsely imprisoning and torturing cats to death in both her native Sweden and now at the University of Missouri at Columbia. Her specialty, however, is intentionally blinding Abyssinians and for that purpose she maintains a colony of them. 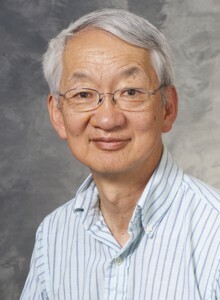 It is Tom Yin and his colleagues at the University of Wisconsin (UW) at Madison, however, who can justifiably lay claim to the prestigious title of being the most ruthless cat torturers and killers on the planet. For an unspecified number of years, he mutilated at least thirty cats each year during the course of his so-called sound localization studies. In addition to all of those unspeakable crimes, PETA has uncovered evidence that a cat named Double Trouble was not even properly anesthetized while she was being relentlessly tortured. She additionally was deprived of food for days, suffered a head wound that went untreated for months, and her face became partially paralyzed. Under intense pressure from PETA, comedian Bill Maher, and actor James Cromwell, UW-Madison claims to have discontinued these experiments in January of this year and Yin reportedly has gone into retirement in order to live happily ever after on the proceeds from his despicable crimes. Apparently no one at PETA has had the presence of mind to inquire as to what ultimately was done with the cats' corpses. Considering his cultural and racial heritage, Yin probably cooked and ate them. It is, after all, difficult to imagine someone like him passing up either a free meal or the opportunity to save a few yuans. If indeed it is true that Yin has been permanently sidelined, that is welcome news. Now is not any time to celebrate, however, in that it is highly probable that hundreds of cats are still being hideously tortured and killed in what is believed to be the more than one-hundred animal research laboratories that dot the sprawling UW-Madison campus much like suppurating cancerous cells. Although PETA devotes a disproportionate amount of its time and resources to stealing, killing, and defaming cats, on this occasion it was, for once, on the right side. None of that in any way alters the disturbing fact that if it had gotten its hands on any of Yin's cats that later were rescued it unquestionably would have killed them off on the spot as opposed to treating their horrific injuries and securing permanent homes for them. "Not only was this not a study of 'vision,' it was of little relevance to human beings. 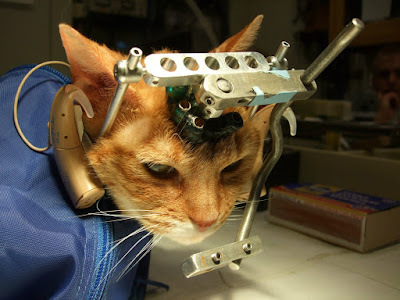 The structure and function of the eyes and brains of cats with respect to vision are substantially different from human beings," Ned Buyukmihei of the British Union for the Abolition of Vivisection (BUAV) said of Cardiff's study of amblyopia in an October 13, 2010 press release. (See "Cardiff University Asked to Justify Controversial Kitten Experiments Exposed by BUAV.") 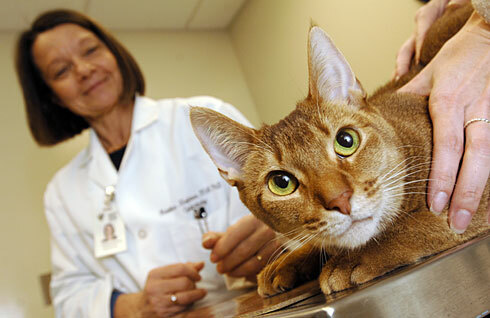 "Furthermore, the information 'learned' from this study is not even of value to veterinary medicine. The cats in question were mutilated and suffered for no benefit to anyone. The information could have been derived from elegant, and ethical, studies on people." To put the matter succinctly, cats always end up paying the ultimate price but yet never are allowed to reap any of the alleged benefits from these studies. Even if some treatment should be discovered that would help to combat feline blindness it is a foregone conclusion that the veterinary medical profession would price it well beyond the means of all cat owners except the super rich. Far from being confined to Cardiff's feline vision studies, Buyukmihei's criticism is applicable to all animal research. The despicable crimes perpetuated against cats and other animals persist, however, simply because there is good money to be made from torturing and killing defenseless animals. The totally unforgivable failure of those who supposedly care about animals to demand in unequivocal terms that these heinous crimes be halted and that the anti-cruelty statutes be stringently enforced also serves as a green light for vivisectors to not only carry on as before but to even expand upon their devilry. "If anyone other than white-coated scientists treated monkeys, dogs, cats, rabbits, pigs, and so forth as they do behind the locked doors of the animal lab, he or she would be prosecuted for cruelty," primatologist Jane Goodall once observed. The money and honors that go hand in glove with torturing and killing cats pale in comparison, however, with the immense pleasure that vivisectors derive from the commission of their diabolical crimes. It is a far too misanthropic sentiment for most individuals to wrap their brains around, but this world is chock-full of individuals whose sole raison d'être is to abuse animals and others. Moreover, these monsters are more likely to be found in high places as opposed to the ranks of the lowly and uneducated. All animal rescue groups, including Cats Protection, are awfully high-handed when it comes to the restrictions that they place upon the animals that they sell back to the public for a handsome profit. For instance, they mandate that they be sterilized, implanted with cancer-causing microchips, cooped up indoors, and shot full of all sorts of unnecessary and, often, harmful vaccinations. Yet, not a single one of them is willing to stipulate that the cats that they adopt out receive proper veterinary care when they need it and, most important of all, that their inalienable right to live be respected at all time and under all circumstances. It thus is clear that they have their priorities all wrong and, although bossy and dictatorial, they actually au fond care precious little about whether their cats either live or die. For better or worse, Pops' life now rests solely in the hands of her anonymous new owner. If she is extremely lucky, that person will treasure her, safeguard both her health and life, and not kill her off when the first opportunistic moment presents itself, such as when she commences relieving herself outside the litter box. That can only be hoped for but it is by no means guaranteed. In the final analysis, her fate is really not all that different from that of all living creatures, man included, in that governmental agencies, charities, and even the the gods seldom can be counted upon once the chips are down. As a consequence, one and all forced sooner or later to rely upon the randomized, totally unpredictable, kindness of perfect strangers in order to go on living. Photos: Cats Protection (Pops), The Shields Gazette (Honeybee), Cody Duty of the Austin American-Statesman (Noble), Sky News (Ernest), USA Today (Gingersnaps and Narfstrom), UW-Madison (Yin), and PETA (Double Trouble).